Online at the post office beats waiting on line at the post office. But is that the best site to buy enough stamps to keep your bills paid? It seems I’m always dangerously close to running out of stamps. And I inevitably have to prepare myself for another ‘adventure’ to the post office. Sometimes, it’s easier just to reach for a self-stick stamp. I Want a Real Stamp! I don’t know about you, but I do not find it especially convenient to just walk into a post office and buy a book of stamps. And purchasing stamps from the automated touch-screen dispenser doesn’t give you the real deal. Recently, these machines have been ‘upgraded’ to spit out this freshly printed but very ordinary sheet of stamps. Yes, they’re legit, but they seem so…generic. Something almost out of a kindergarten art project. The other morning, I peeled off a little 47-cent ‘Forever’ square and realized I only had two left. It was time to jump into action. But I was determined not to get out of my chair. I turned on my iMac. Its glow powered my resolve. “Send me stamps,” I whispered evilly. Then I realized I was momentarily caught in a temporal rift, and I was channeling my future self ten years out. I sighed and looked around to see if anyone got the joke. The rest of the family was still asleep. I figured the U.S. Postal Service must sell stamps online. Buying stamps at usps.com… it seems so patriotic. Well, I happened to notice there would be a shipping fee. And you have to sign up for an account to discover how much that would cost. I’ve been so spoiled by the free shipping convenience of Amazon Prime. I immediately went to Amazon to find my stamps. Price: $13.35 for 20 stamps. My neurons powered up to do the short math. I reached for the calculator instead. Their deal turned out to be a little more than 66 cents for a 47-cent stamp. That’s a huge mark up!! I can’t be the first person out there looking for a good deal on stamps online. 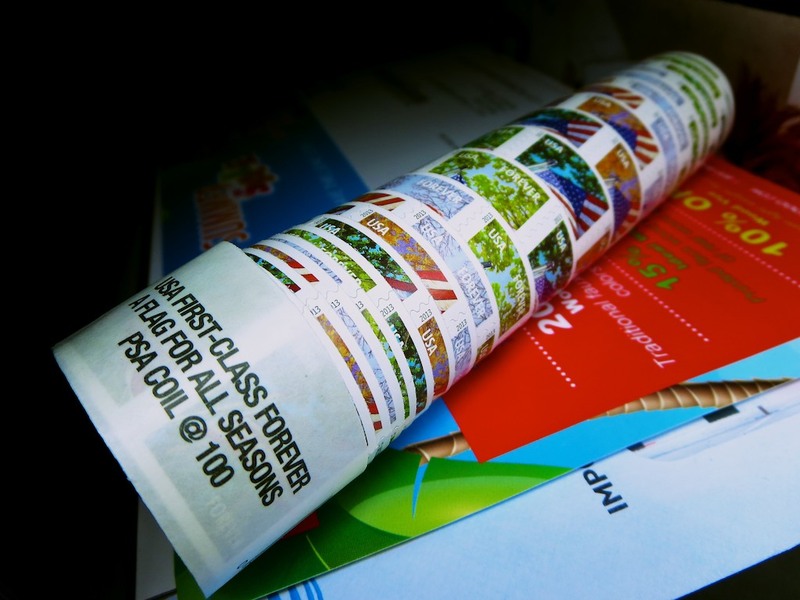 Their website offered a cool roll of 100 stamps for $47 with free delivery. But then I noticed there’s a $1 ‘Processing Fee’ added at checkout. But I still pulled the trigger, reluctantly. The convenience of free home delivery was worth the dollar. But I still wasn’t 100% satisfied. I went back to Uncle Sam to check out his shipping costs. Of course, usps.com offered the traditional Forever flag stamps. You can order in incremental strips of 20 or 25 stamps. And in case you suddenly find the urgent need to buy 10,000 stamps, have no fear. The United States Postal Service has got you covered. It just takes a click and $4,700.00, and you’re ready to go. I’m not so sure how many people are clicking for 10,000 stamps, but our government has got them at the ready to ship out to you! I got back to the shipping cost question. I took the few minutes to sign up with the government. I experimented by putting in a few different orders into the shopping cart. And do you know what I discovered about the shipping charge? The United States government apparently has this great flat-rate shipping deal going with our post office. Plus, there’s no processing fee to infuriate you!! So I immediately felt buyer’s remorse. But comparing officedepot.com to usps.com… the pricing is actually kind of a wash. I figured I should check out the rest of what usps.com had to offer. So for many situations, you don’t ever have to go to the post office ever again! I think usps.com is going right into my favorites folder. I prefer online artificial intelligence over pod people any day…. Come on… you know what I’m talking about. Come to think of it, when you’re online late at night at usps.com, it’s probably a wise move not to fall asleep.